Please find below the text of the talk I gave at TedXCentralUniversity2016. If you know me, you will know that I am a talkative so I did a bit of ad libbing. But the essence of the talk is captured here. I chose the topic ‘Retelling the Ghanaian story’ because I am a storyteller and I am very passionate about Ghana. I hope this inspires someone to do better for our beloved motherland. Enjoy! My name is Maukeni Padiki Kodjo. Most of my friends call me Keni for short; probably because it is less of a mouthful. I am a storyteller. For the last two years, I have been telling authentic Ghanaian stories on my blog- www.kenikodjo.com. My stories are about everyday Ghanaians doing everyday things: from the trotro mate right through to the single mother to the potbellied landlord and the NDC foot soldier. Everything- it’s all there. Whenever I tell a story, I do my best to capture the true essence of the character so that you are either nodding along as you listen and saying to yourself ‘I know someone like that’ or thinking ‘this is something I would do.’ I cultivated the habit of reading in my childhood. I read a lot of stories. My bed time was 7pm but I was always determined to finish whatever book I was reading that day before sleep took over. If it was past 7 pm and I was in danger of breaking the rules, I would cover my head with a blanket and continue reading with the help of a flashlight. That’s how I ended up with these glasses. So trust me when I say I know a bit about storytelling; it came with a bit of sacrifice! A couple of weeks ago, I had a conversation with two of Ghana’s finest women journalists and asked them a question. I would like to ask you the same question today. Close your eyes if you want to and try to imagine or envision, in your mind’s eye, Ghana a century from today. What I see scares me because of where we are today. The Ghanaian story we are telling today is not a best seller. Remember this guy? We share the same birthday; he and I. But that’s not why I am showing his smiling face. I am projecting his face because he wrote one heck of a Ghana story. The one we retell and celebrate every Independence Day. Allow me to tell you a story. After all, I am a storyteller. This story is about a young man called Ato. The Ghana in which Ato grew up in was exciting. 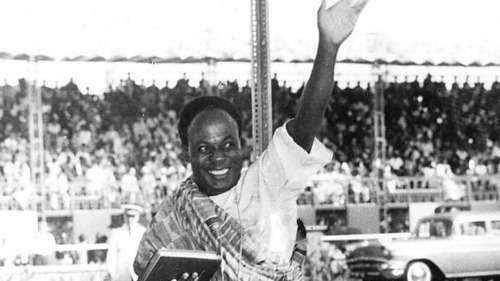 He was there when Ghana was declared independent. He stood at the Black Star Square with his friends, scrambling to get a glimpse of the man who was confident that the black man was capable of managing his own affairs. The aeroplanes he saw in the sky had Ghana Airways inscribed on them in our beautiful national colours. His wife and son went to the Tema Harbour to pick up her goods, his son’s wide-eyed gaze following the cranes as they effortlessly lifted the containers. He had never seen anything like the Accra-Tema Motorway before. His neighbours attended good schools and studied impressive courses- one of them was going to become a doctor. For Christmas, he looked forward to the Piccadily biscuits, the rice, stew and egg, and of course the fire crackers. His son had a future. His nation had a future. Beautiful story, isn’t it? When a child starts to crawl, we are all excited. We can hardly wait until he starts standing with the aid of a table or anything that his chubby fingers can grab and grasp. We look forward to every little triumph that the child makes as it grows up. Ghana has not been growing up well for a long while now. Sports, health, culture, education, infrastructure, science, agriculture, waste management, entertainment, sanitation, transportation, name it! We are still crawling and, even worse, we seem comfortable or, at best, indifferent about it. This is not good enough. This cannot be good enough. Can you imagine how heartbroken Ato must be right now? And while we must not cry over spilt milk, we must clean up the mess and move on. I am a Christian and the Bible is my favourite book to quote from. In Exodus 4, Moses was distraught. God had called him to lead the Israelites out of the iron grip of Pharaoh and his oppressive rule. He was probably wondering if the people of Israel would think he was out of his mind for saying that the ‘I AM THAT I AM’ had sent him. Who would listen to him? Who would believe him? Where had that God been all this while? Moses used his staff many times to save the day in the story of Israel’s exodus- and ultimately to part the Red Sea for the Israelites to cross over. Why are we having a Sunday school lesson? Because that statement is profound. Today I ask every one of you seated here this same question. Think on it for a bit. Moses had nothing but a staff. You may have nothing but a song. Or a really good book. Or a love for proverbs. Or an entrepreneurial mind. Or a killer kelewele and domedo recipe. Or a Masters’ Degree in Engineering. Or an idea for a cure for some malaria or cancer. Or legs that can win races and score goals. Or a fashion line that will silence Prada and Louis Vuitton. You may have nothing other than a heart that beats for Ghana. And trust me, that is more than enough. Use it to expand and enrich and retell the Ghana story. Let’s change the story to one of progress, unity and growth. Let’s transform the Ghana story into a best selling story; a story that elevates and inspires us to greater and greater heights. The words of our national anthem always inspire me when I recite them. Yes, recite- because when I sing it, like many of you, I switch to auto pilot. The words have so much meaning and they inspire me to do better for our nation. Let’s tell a best seller Ghana story. With our gifts of mind and strength of arm. Let’s be the best Ghanaian writers, farmers, nurses, artists, politicians, footballers, TV show hosts, musicians, pharmacists, seamstresses, policemen that we can be. Let’s tell it to honour those that have gone before us. Let’s tell it to inspire and guide those that are destined to take over from us. Most importantly, let’s tell it for our motherland Ghana. It’s about time we retold the Ghanaian story! Nice one Keni! Sometimes it’s good to be reminded that you don’t have to be perfect to make a difference. You inspire me Keni. Thank You and God bless you. Great Keni,God bless you.I am really inspired.Ghana will surely work again. Thank you for telling the Ghanaian story. Great piece. Powerful Lesson – Use what you have. I think you are a perfect example of this lesson. Please is the video on YouTube? Wow Keni. I always wish I could the difference, make a change but i still haven’t found what’s in my hand. It keeps changing, I’ve prayed to God for it and am waiting patiently but sometimes i feel am running outta time, am my age i feel i could have been better than i am but I’ve still not found myself or maybe I’ve but not paid fervent attention to. Nice piece Keni, God bless you abundantly to keep inspiring and motivating us. Don’t give up. Keep searching and when you find it, use it. God bless you too! Way to go girl!!! We going soooleeely Ghanaian!!!! Thanks for the reminder Keni that we all have something in our hand we can use. Great Keni! I’m always late in reading your posts…. Very happy to hear that. Welcome to the fam!